Tin is the main constituent of pewter, and given Ashburton's association with tin it is not surprising that pewterers also worked in the town. Because tin is so soft, other metals, such as copper or lead, are mixed with it to make a suitable compound for forming into a variety of artefacts. The Pewterers' Company has existed as a City Guild since medieval times. Pewterers of a sufficient standard used a trade mark, called a touch mark, which often incorporated the maker's name or initials. 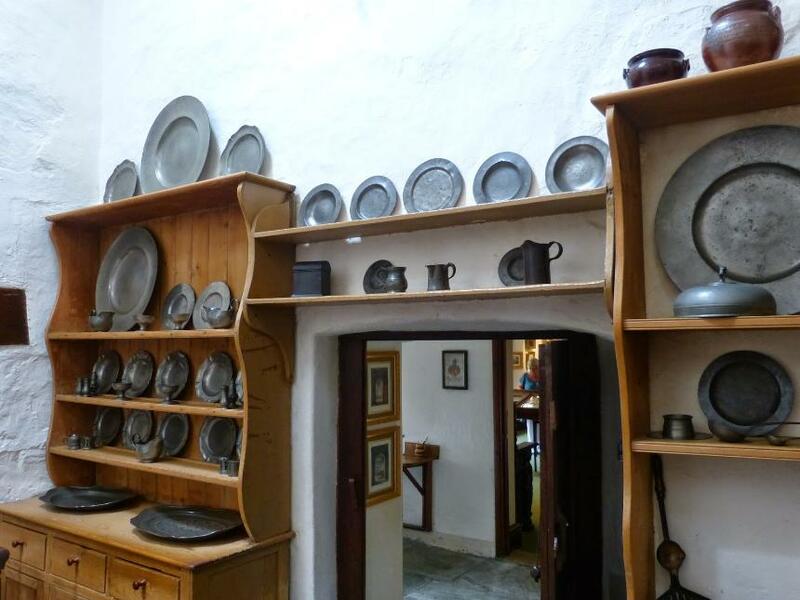 Pewter was used for plates, flagons, dishes, porringers - and 'from 1300 to 1800...was as familiar as china is today'. 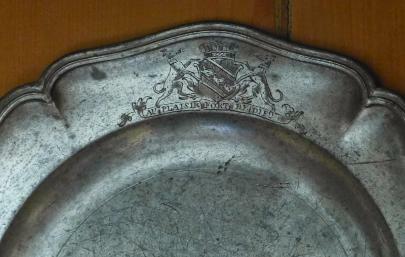 In a will of 1629 John Wreaforde of Ashburton left a pewter dish to his daughter Peternell, wife of Richard Taprill. Some pewter items mentioned in connection with Devon at the National Archives: plates, noggin, mug, chamber pot, hoggin, flaggons, saucers and pewter linings for salt cellars. In Walter Palke's will of 5th November 1677 the inventory of the effects of the deceased mentions ten pewter dishes, 16s. Above: Pewter in the kitchen of Cotehele, Cornwall. During 1571-72 John Alys, pewterer, agreed to repair all the church lead for the remainder of his natural life, for the sum of 40s in hand. The contract, or covenant, was made with the 8 Men and the 'parysshe.' It is not certain that John Alys was an Ashburton resident, but it seems likely. Among the residents in Ashburton in 1599 is William Knowling, pewterer. Many thanks to Steve Custons for this information - extra information credited separately. On 22nd June 1635 Thomas Knowles married Xpiana Dyer at Ashburton. Apprenticed to John Knowles and his wife Marie. On November 29th 1714 Laurence Langworthy, apprentice of [blank] pewterer, was entered onto the roll of Exeter Freemen. An oblong pewter dish dated 1719, with two marks, touches of Lawrence Langworthy, is at the National Trust property of Arlington Court, Devon. In 1722 the apprenticeship of John West was registered, to Lawrence Langworthy, pewterer, at Exeter. Southcot, the son of Mr Lawrence Langworthy and Mary was baptised on the 8th June 1720, at St Mary Major, Exeter. Mary, the daughter of Laurance Langworthy, was baptised on the 6th February 1721, at St Olave, Exeter. A daughter of Lar: Langworthy, pewterer, was baptised on the 12th July 1723, at St Olave, Exeter. A bell-metal posnet, marked by Lawrence Langworthy, Newport, dated 1730, sold at Christie's, New York, in 2012. William Taynton, pewterer, mainly associated with Gloucestershire and Bristol, is listed as a voter in Ashburton in the 1774 Bristol poll book. Thomas Cole married Ellinora Beere at Ashburton on 19th April 1627. Ten years later, in 1637, a John Bone/Bonner was searched at Ashburton, ie representatives of the Pewterers' Company checked the quality of his wares. Bowls by Bonner were found in Thomas Cole's shop, and this is possibly the same Thomas as above. Chamberpots by William Bourne of Ashburton were also found in Thomas Cole's shop in 1641. William was searched at Modbury Fair that year. Porringers by Lawrence Langworthy of Ashburton were also found in Thomas Cole's shop. Lawrence was searched in 1637 and 1641. In 1637 Lawrence Langworthye, East streate, paid 1s to the Ashburton Poor Rate, and Lawr Langworthie, East streete, paid 9d in 1644. Laurence Langworthy was buried 29th December 1680, Ashburton. John Langworthy was one of those making an affidavit [that he had been buried in wool]. In 1641 Alexander Soper of Ashburton was searched at Modbury Fair. In the same year Alexander Soper, possibly the same one, married Agnetia Stevens at Ashburton. Agnis Soper, wife of Allexander, was buried 16th April 1666. In May 2015 Bonhams sold what they described as a rare semi-broad-rim pewter plate from around 1625-1635. It bore the shield of Piers Edgcumbe, of Cotehele House, Cornwall, who died in 1660. The plate had hallmarks to the front and the touchmark of Nicholas Dolbeare on the rear. Nicholas was from Ashburton, working between 1620 and 1651. The plate realised £1750 including premium. Bonhams stated that is was possible that the plate came from a lot of 266 pewter pieces from Cotehele sold by Sotheby's on June 1st, 1956. Source quoted on the website: Journal of the Pewter Society, Vol. 40, Autumn 2014, pp. 36 - 39; and Vol. 18, Autumn 2002, p. 28 for an article entitled 'The Dolbeares of Ashburton'. A Nicholas Dolbeare married Claria Quint on the 29th November 1621, but there appear to have been two people with this name. A Nicholaus Dolbeare was buried 22nd March 1637 Ashburton, probably the Nicholas Dolbeare, tanner, who left a will proved in the Prerogative Court of Canterbury in 1638. In 1625 Nicholas Dolbeare, probably of the East streete (the list went on to a new page) paid 2s 2d to the Poor Rate of Ashburton. The next person on the list was John Dolbeare. Nicholas Dolbeare, again probably of East streate, paid 7s in 1637. A Barnardus Dolbeare, the son of Johis, was baptized on the 7th September of the same year. 1644 John Dolbeare , pewterer, paid 2s 3d 'for the releyffe of the poore wth in the pish of Aishberton'. 1655 'The agreement of marriage between John Dolbeare of this pish, pewterer, and Susanna Necke also of this pish was delivered onto the register the 14 day of Novemb 1655 and published three Lords daies following. 1661 Mary, the daughter of Jo. Dolbeare, pewterer, was baptized 28th November. 1662 John and Mary, the children of John Dolbeare, pewterer, were buried on the 2nd March. John, the son of John Dolbeare, pewterer, was baptised at Ashburton 12th May 1664. Are the following records for a different John Dolbeare? It is possible that the term pewterer is used on other records to distinguish the two. 1657 'The agreement of marriage between John Dolbeare sonne of John Dolbeare the elder of this pish and Alice Fursman daughter of Thomas Fursman, also of this pish, was delivered unto the register 14th day of March 1656* and published three Lords daies followinge. *Old calendar - we would say 1657. By 1671 an Edmund Dolbeare*, pewterer, had emigrated to Boston, Massachusetts - he gave a deposition in a court case that year. It is thought he came from Ashburton, and at some stage his wife and two children, John and Joseph also arrived in Boston. 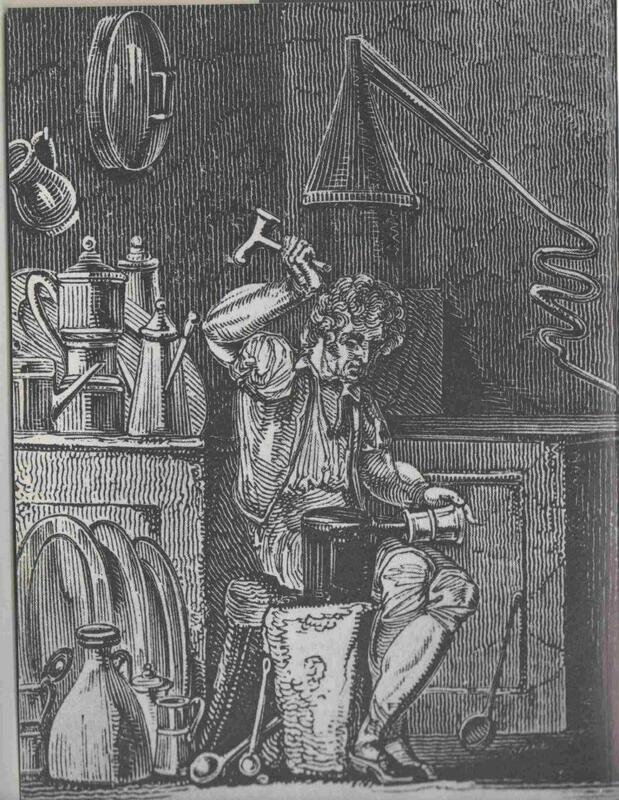 John became a pewterer like his father, but also worked in brass and iron, and became extremely successful. Although Edmund's mark is unknown, John's was of three plumes, and some of his work survives. He features in Laughlin's book Pewterers in America. *An Edmundus Dolbear, son of Thomae, was baptized at Ashburton 25th August 1633. An Edmundus Dolbeare, son of Johnis, was baptized 16th June 1644. The Dolbeares of Boston, by Edward Doubleday Harris Esq. Boston, New England, 28th August 1772. Mr Benjn Dolbeare*, at Ashburton in O. England. Above: John Dolbeare of Boston. The Founders, Portraits of persons born abroad who came to the colonies in North America before the year 1701, Charles Knowles Bolton, The Boston Athenaeum, vol III, 1926, p 773. ...Therefore take this opportunity to acquaint you as far as I know, how the relationship came about, viz. my late father Mr John Dolbeare came from Ashburton into this country with my grandfather Mr Edmund Dolbeare, my grandmother and uncle Joseph, about the year 1664, my father and uncle Joseph served their times with my grandfather to the pewterers trade, in which business my father set up and added to it the ironmongery trade, both which he carried on to the year 1740...My grandmother died a few years after she came over here, and my grandfather married again...My brother James who was at Ashburton to visit his relations there in the year 1738 (when I suppose you saw him there)...he gave an account of our relations there and that there was none of ye name but were related to us...If you think it worthwhile to write to me at any time, direct to Benjamin Dolbeare, Merc. in Boston, New England, and it will come safe to hand. I wish you health and prosperity and am Yr unknown kinsman, Benjamin Dolbeare. Memo. Ashburton is in the County of Devon, abt 20 miles from Plymouth & Exeter. *I rec' a letter from him and his name is John, instead of Benjn. John the son of Bernard Dolbeare was born 22nd August 1683 and baptized 12th September. This is possibly John  below. According to the database of the Pewter Society, the widow of John Dolbeare  worked between 1713 and 1762, and died before 1772 aged 82. John D Davis, in his book Pewter at Colonial Williamsburg, says that John Dolbeare, of Ashburton, Devon (1720-1750) had a touchmark of a rose with a crown above and a palm frond to either side, and J Dolbeare written below. According to the database of the Pewter Society, Susanna Dolbeare worked between 1725 and 1762, dying unmarried circa 1770. Susanna Dolbear of Ashburton left a will proved in the Consistory Court of the Bishop of Exeter in 1770 - no longer available, as Exeter wills were destroyed during bombing in WW2. Journal of the Pewter Society, Aut 2002, p27 -29. 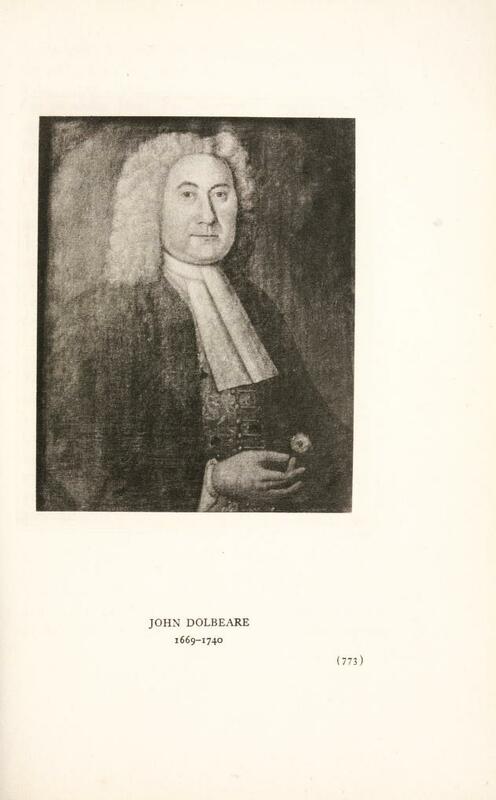 John Dolbeare, son of Bernard Dolbeare, was baptized 9th August 1743. Bernard was also the father of Bernard Dolbear, baptized 19th August 1746. According to the database of the Pewter Society, John was John Dolbeare  who worked between 1762 and 1794. A John Dolbeare married Joan Winsor 22nd January 1770. Susanna Dolbeare was one of the witnesses. On the 21st February 1774 the couple had a daughter, Susana, baptized at Ashburton. 1790 Confirmation of lease by Thomas Naylor, vicar of Ashburton to John Dolbeare (it is not certain that this is the same John Dolbeare). John Dolbeare was buried at Charles the Martyr, Plymouth, 26th November 1794. 'Burying ground' is written beside the parish register entry. In his will, proved in June 1795, he describes himself as being of Plymouth, gentleman. He wished to be buried 'in as private a manner as possible' and allocated 5 shillings each to 8 poor men to carry his coffin. He names nieces Mary and Sarah Thomas - daughters of his sister Susanna Thomas* - and his daughter Susanna Parham. 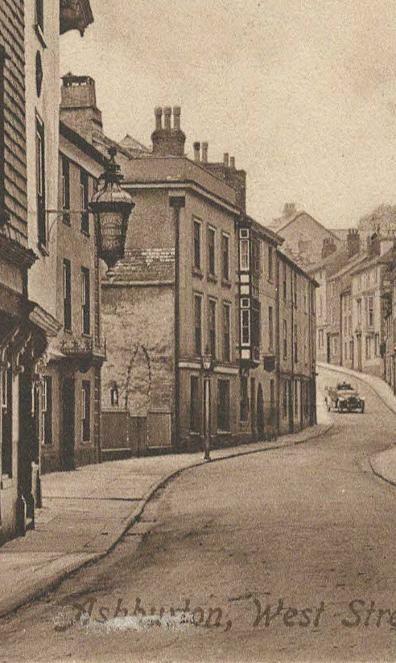 His messuages, lands, tenements and hereditaments were within Ashburton, Newton, Newton Abbot and Chudleigh. Joan Dolbeare, widow, left a will proved July 1816, in the Prerogative Court of Canterbury. In 1773 Thomas Naylor, Vicar of Ashburton, had granted a lease of messuages and tenements to John Dolbeare, pewterer. This could have been a renewal of the lease. March 1798 John Way and Henry Bowden were executors of the will of John Dolbeare  above. The vicar, Thomas Naylor, confirmed the lease of a cottage and tenement to the executors, for the lives of Susanna Parham, wife of Benjamin Parham of Plymouth Dock, Benjamin Parham the younger and his wife Susanna, and Solomon Tozer of Ashburton, clothier. For the family connection between the Dolbeares and the Parhams, and later between Edward Cruse and the Parham family, see below. The 1841 census shows Benjamin Parham, an attorney at law aged about 70, living in West Street. With him is his 60 year old wife Susanna, and another Susanna aged about 30. They are the next household on from Thomas Foaden, innkeeper (ie the next household after the London Hotel). This would be a building, now demolished but remembered by many Ashburton residents, that stood in what is now the entrance to St Andrew's Close. Above: The entrance to St Andrew's Close. 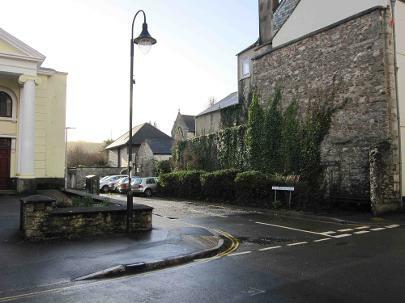 The yellow building on the left is the Methodist Chapel, which was only built in 1835. The 1871 census shows an Edward and Elizabeth Cruse living in West Street. Both are 50 years old. They are still in the same property in the 1901 census. It is not always easy to precisely place properties on the census, but the proximity to the London Hotel suggests that this property is the one above that is now demolished. In August 1905 Sawdye and Son sold a large amount of antique furniture, paintings and china from Paradise House in West Street, on the instructions of the representatives of the late E Cruse. In the early 1900s P F S Amery wrote an article in Devon Notes and Queries about some oak panels from the 1500s, which were in a house belonging to one branch of the Prideaux family in Ashburton. According to Amery the house passed down to the Parham family and then to a Mrs Cruse, finally being sold in 1905 after the death of her husband. The panels were in a small back room in a house in West Street, very close to the parish church. The back buildings and stable accessible from the left of the church gates; there was also a footpath under an archway that led to the same buildings. The old walled garden formed a boundary to the churchyard on the eastern end of the church. See People and properties, 1600s and before, for more on the panels. Benjamin Parham, gentleman, had married Susanna Dolbeare at Stoke Damerel on the 29th January 1793. Benjamin was of Stoke Damerel parish, and Susanna was of Charles in Plymouth parish. The bride, a minor, was married with the consent of her father, John Dolbeare, who had declared his consent in person. Susanna was Susana Dolbear, the daughter of John and Joan, baptized 21st February 1774 in Ashburton. A John Dolbeare had married Joan Winsor in January 1770, with a Susanna Dolbear as one of the witnesses. The will of Joan Dolbeare, widow, proved at the PCC in July 1816, names Susanna Parham, the wife of Benjamin Parham, as her daughter. Also named are Benjamin Parham the younger, son of Benjamin and Susanna; John Dolbeare Parham, and Susanna Dolbeare Parham. Joan named a nephew, John Winsor, and her sisters Mary Sunter and Susanna Winsor. The court ruled that the curate must restore the pew, but also stated that in future the family were only entitled to part of the pew, not all of it. Neither party in the case were satisfied with this ruling, and it went to appeal. A memorial inside St Andrew's Church reads as follows: This tablet records the death of Benjamin Parham esq of Claines formerly judge of the county court of Worcestershire which happened on the 16th day of August 1861, in the 68th year of his age. Also of Mary Palk, his wife who departed this life on the 10th day of September 1849 in the 62nd year of her age. Also of Benjamin Parham esq of this parish father of the above who died at Hawford Lodge Worcestershire, on the 24th day of July 1851 aged 82 years. Also of Susanna his wife who died on the 30th day of May 1843 aged 70 years. Also of Rev John Dolbear Parham son of the last named Benjamin Parham who died on the 29th day of September 1858 aged 62 years. Also of Susanna Dolbear Parham only daughter of the last named Benjamin Parham who died on the 20th day of September 1860 aged 58 years. 1863 Mr Edward Cruse, a paymaster of Victoria (London) Docks, married Elizabeth Elston on May 12th. She was the only daughter of the late Benjamin Parham, County Court Judge for Worcester. Miss Elston was described as the illegitimate daughter of Benjamin in a dispute after his death, reported in the same newspaper a year earlier. Edward Cruse died in June 1905 and was laid to rest in the Parham vault.